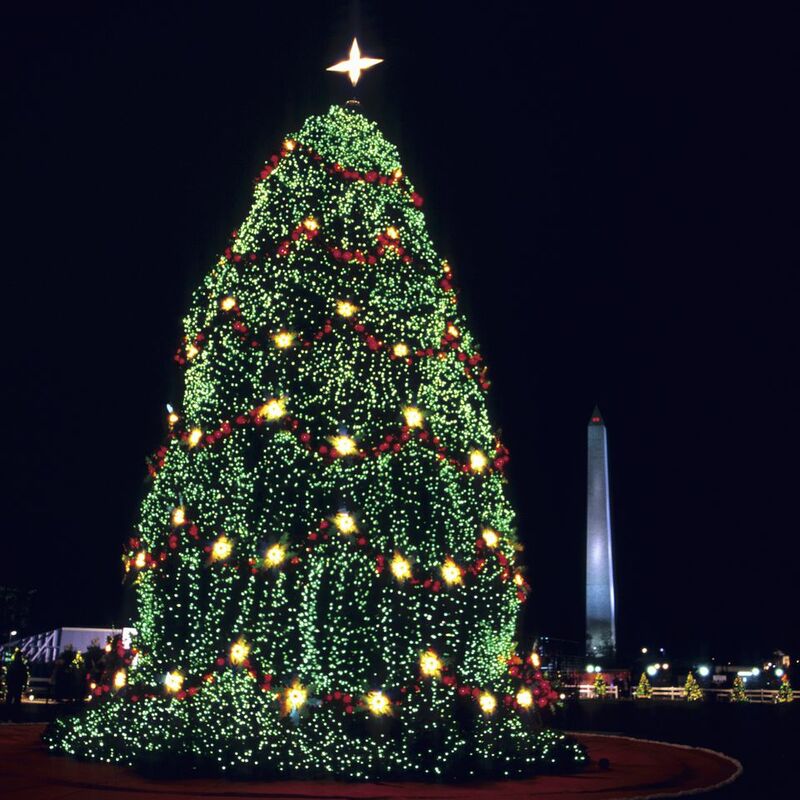 Visit the National Christmas Tree in Washington, D.C. The National Christmas Tree and the Pathway of Peace is illuminated daily at dusk until 10 p.m. Each night in December, musical groups from the Washington, D.C. area entertain visitors on the Ellipse, in front of the White House. This is one of the most memorable ways to enjoy the holiday season in the nation's capital. Although tickets are required for the Lighting Ceremony, the nightly events following are open to the general public. Celebrate the holiday season with a drive or a stroll through one of the Washington, D.C. area's spectacle of lights at a local park or along the water in Maryland, or Virginia. These Christmas light displays are beautiful and a great way to share the magic and joy of a winter wonderland. For all of the dates and locations around the region, see a guide to the Washington DC Area Christmas Light Displays. Visit Gaylord National Resort's ICE! Step inside a winter wonderland created entirely of 5,000 blocks of ice weighing 1.5 million pounds, hand-sculpted by 40 international artisans and kept at a chilling nine degrees Fahrenheit. With a new theme each year, this interactive holiday attraction at Gaylord National Resort is one you won't want to miss. Take a candlelight tour and enjoy the festive holiday décor of historic homes in the Washington, D.C. area. Several house museums in Maryland and Northern Virginia offer candlelight tours, complete with seasonal music and holiday treats. George Washington's 18th-century Mount Vernon Estate is one of the most spectacular to explore by candlelight. Watch hundreds of Scottish clansmen with their bagpipes gather for the traditional favorite Scottish Walk Parade. Later that evening, see dozens of festively decorated pleasure boats light up the sky along the Potomac River. Alexandria is a magical place during the holiday season with a wide array of events and one of the best shopping districts in the capital region. Washington, D.C. celebrates the season with a wonderful lineup of holiday shows and live entertainment. Take the whole family to see the Washington Ballet's Nutcracker—marvel over Clara’s Christmas fantasy when the wooden toy soldier comes alive and takes her on a magical tour of wonderful holiday adventures. Explore the magic and wonder of the story of Scrooge and the progression to Christmas past in Charles Dickens' A Christmas Carol at Ford's Theatre. Get in the spirit of the season as you enjoy a musical performance of Christmas classics, sing-alongs, Hanukkah songs, and much more. Live concerts are performed by a wide variety of musicians ranging from national to local talent to community groups to church choirs. Toy train displays are a family favorite for the holiday season. See model trains wind through a miniature winter wonderland with farms, a fishing village, churches, a ski jump, and more. Some favorites include the Garden Railway Exhibit at Brookside Gardens, the Seasons Greetings Show at the United States Botanic Garden, and the Union Station Holiday Train. A National Hanukkah Menorah is lit on the White House grounds, at the Ellipse during the eight-day-long Jewish holiday commemorating the Jewish Maccabees' military victory over Syrian oppression more than 2,000 years ago. Festivities at the lighting ceremony include musical performances and hot latkes and donuts. Ring in the New Year with the kids at a special event with live performances of music, dance, theater, fireworks and more. You don't have to spend a lot of money to enjoy a night of celebration. A variety of family-friendly, low-key, and low-cost events are held throughout the capital region.